1 Microwave olive oil with Knorr® Chicken flavor Bouillon in small microwave-safe bowl at HIGH 30 seconds; stir and cool slightly. Process bouillon mixture, onion, cilantro, chipotle, sugar and garlic in food processor until smooth. Combine 1 tablespoon mixture with Hellmann's® or Best Foods® Real Mayonnaise and lime juice. Refrigerate until ready to use. 2 Combine remaining mixture with chicken in resealable plastic bag; turn to coat. Close bag and marinate 30 minutes. 3 Remove chicken from marinade, discarding marinade. Grill or broil chicken, turning once, until chicken is thoroughly cooked, about 8 minutes. Shred chicken and keep warm. 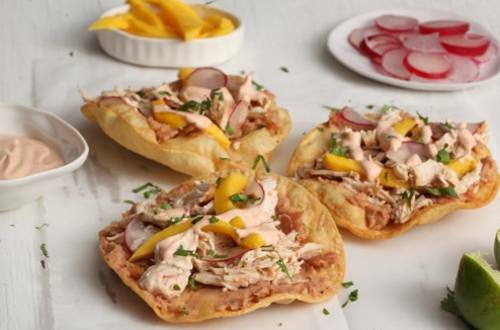 4 Evenly spread beans on tostadas, then top with chicken, mango and radish. Drizzle with mayonnaise mixture. Garnish, if desired, with cilantro leaves. *SUBSITUTION: To make your own tostadas, fry corn tortillas in small skillet in oil, one at a time, turning once, until crisp; drain on paper towels.